The most destructive storm that ever visited this section of the state devastated the country district to the southwest, passed through the residence section in the south part of town and continued its destructive course to the northwest, leaving a desolate path behind and doing thousands of dollars worth of damage to property on Saturday afternoon April 20th. Houses, barns, and outbuildings were unroofed or annihilated, trees uprooted and live stock killed and maimed. Telephone and telegraph lines were blown down and wires hopelessly tangled and windows shattered to fragments by hail stones from 10 to 14 inches in circumference. In some places the havoc was so complete that it seems impossible that it could all occur without loss of life. The property loss will reach close to $100,000. The cyclone that hit Hennessey, Oklahoma in April 1912 was disastrous to the area and I believe my paternal great, great grandmother Mary Brown nee DeFries witnessed it. 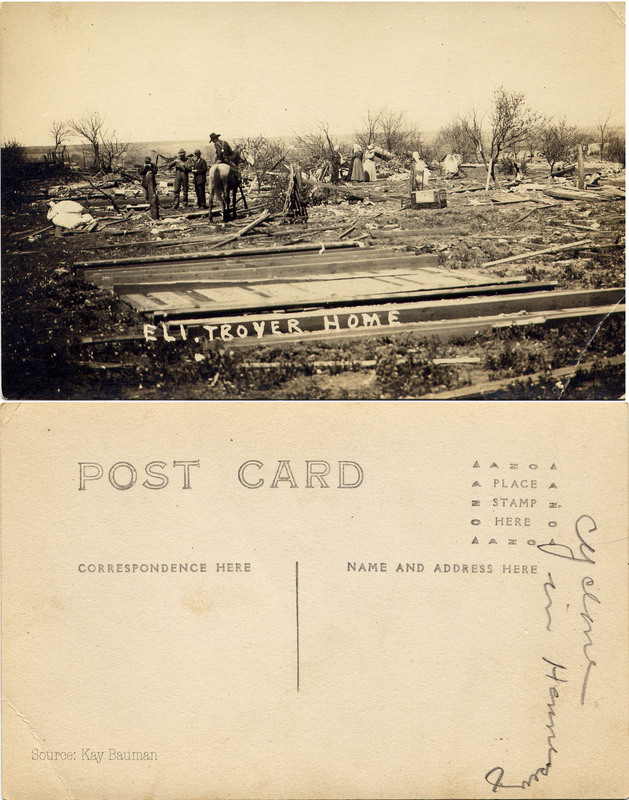 Among my great aunt’s photos are a few real photo cards that show the damage to houses and a train. While one of the photos is labeled ‘cyclone in Hennessey’ the others aren’t labeled at all nor were they found together. Was Mary Brown there and are these photo cards of the same event? The first photo, which I’ve written about before, shows several houses that have been thrust together and have damage to the roofs, windows and frames. 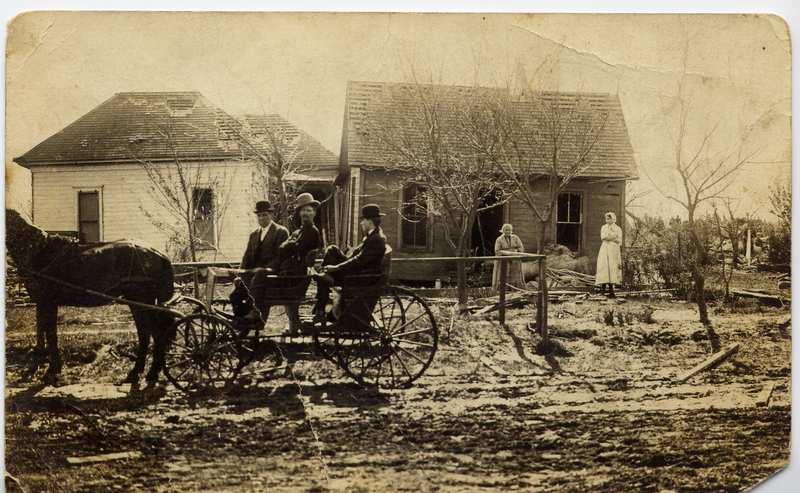 I believe the older woman standing in front of the home is Mary Brown nee DeFries. 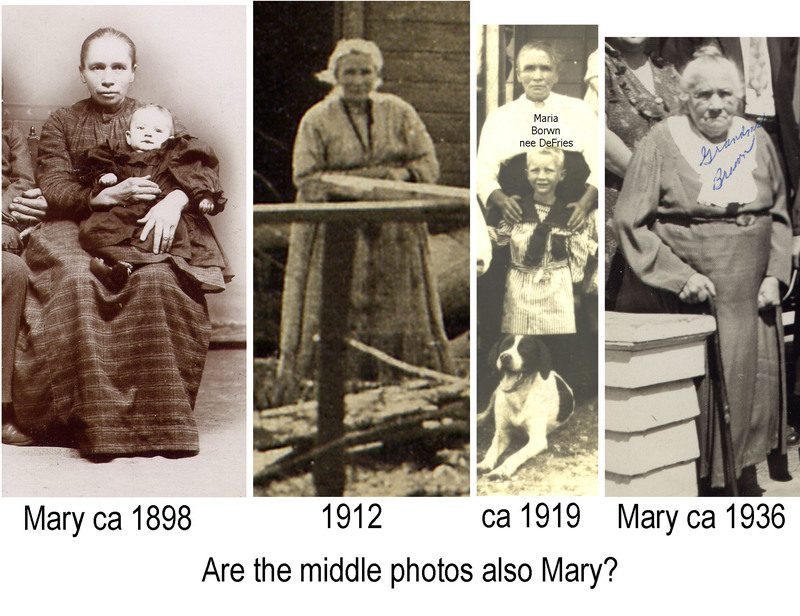 Here is a series of photos of Mary, two of the photos have been positively identified (1898 & 1936) while two are my guess. I’ve enlarged the portion of Photo A with the woman in it and labeled it ‘1912’. What do you think, are these all the same person? According to family tradition, their seventh child was born in July 1893 in Hennessey, Oklahoma. The 1900 census shows the family living in Lacey, Oklahoma, a town that is about 10 miles west of Hennessey. Mary’s husband, Isaac, died in 1902 then her daughter died in 1906 and both are buried in the Lacey Cemetery. Also, in 1906 Mary owned land in Coronado Township, about 10 miles southwest of Hennessey, and was still living there for the 1910 census. (ii) Mary moved to Enid about 1917 and the census confirms that she was living in Enid with her two youngest children and another son was her neighbor in 1920. (iii) It’s seems highly probable that Mary was living southwest of Hennessey in 1912, which was the path that the tornado took. Here’s a link to a map of the Hennessey area and the green arrow is Coronado Township. The Brown home to the north was moved from its foundation and but slightly injured, while the Whaling residence near it, occupied by Rev. and Mrs. O.G. Brown, was whirled clear around and landed on top of the cave southeast of the foundation, the roof was broken in and the contents of the house were a jumble of fragments. Scene at Eli Troyer home where storm demolished house, barn, outbuildings and partially destroyed cyclone cellar in which Mr. Troyer had taken refuge, the rest of the family being absent from home. The Press-Democrat’s April 26, 1912 caption for the photo read “The Troyer place southwest of town, after the storm”. While the photo card may have been a card that locals purchased, Mary’s neighbor in the 1910 census was Daniel Troyer and I wonder if he may have been kin to Eli who did not appear in the Hennessey census until 1920. Another photo card appears to be of an overturned train. Is this from the tornado in 1912? I found no mention of a train being damaged but there was a train station in Hennessey and damage would have been likely but I have no facts to support a connection to the cyclone of 1912. Did this cyclone or tornado impact my ancestors? I think so, based on their ownership of photo cards showing damage one of which specifically identifies the cyclone plus the facts that indicate the family lived near the area at that time. As of today, I’ve met only one relative who actually knew Mary and he was 11 years old when she died many years later. He does not recall ever hearing her or others mention that the family was in a tornado. For sure Mary endured many hardships before 1912 including: immigrating via a sailing vessel from Holland in about 1866 at the age of 9; being widowed by 1902 still with young children (4, 9, 11, 13 years old) to raise; the death of her 17 year old daughter in 1906; and in 1908 her father’s death. The cyclone near Hennessey and its aftermath was probably a comparatively easier experience to Mary, at least emotionally. Since the family kept photos of the cyclone’s damage, the event must have been significant to the family though there are no stories to accompany the photos to tell us of their experience. Descendants of Jacob and Anna DeFries, by Minnie Brown Swain and Mary Fales, 1980’s. Family distribution. Mary seemed to live with or near her children and grandchildren and following the dates and locations of their marriages and the births it appears that the family was in Enid by 1917. Once again, an excellent job of research, deduction, writing and identifying with people you never met. I do think it’s highly likely the woman is Mary and that she is in front of her home (the two houses are definitely similar). It appears as if the girl beside the woman may be fairly young and Minnie would have been 14 – so it may be her. I agree that the girl could be Minnie. Also, I have photos of Minnie and the photos do not eliminate her as a possibility. 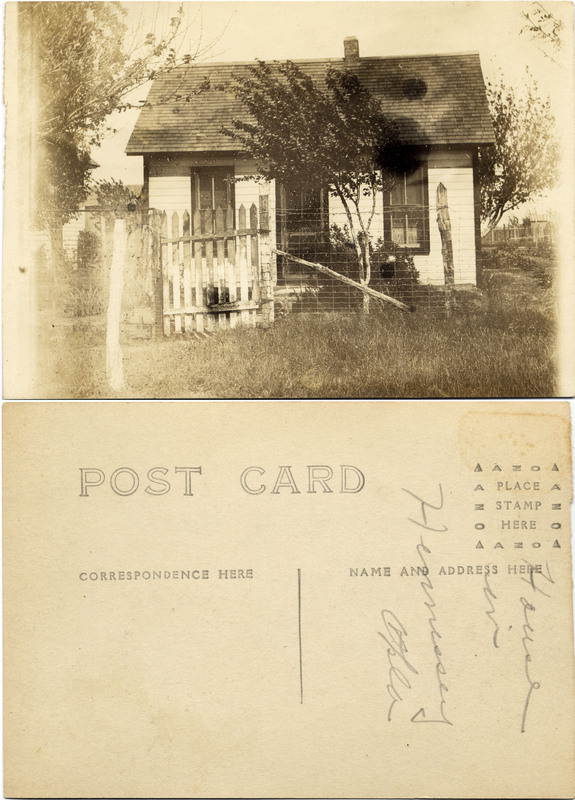 Thanks for sharing the detailed image of that postcard showing the house and the story of your family’s experiences, Kay. A very interesting scenario. You can almost hear all of those folk with their arms crossed sighing, “Well … whatever next?” I agree that the two photographs in the middle dolook like the same person as the outer photos. Brett, thanks for visiting again. I appreciate all the expertise I can get with my genealogy & photo research. What a great example of historical detective work centered around postcards. Thanks Evelyn. It was fun to do and I wish I had more postcards in my collection so I could participate more in the Festival of Postcards that you host.